I found a great do-it-yourself project on Pinterest for all of you coffee lovers out there! Do you love waking up to the smell of coffee in the morning? Here’s a way to recreate coffee scented candles. 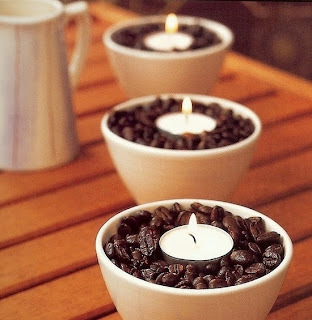 Fill a small bowl with coffee beans and throw a tea light candle in the middle. When lit, the warmth of the candle gives off a beautiful coffee aroma, which fills up the room in no time. Enjoy!